Dance Floors of all types are a good way of defining a dance area. Typically if a venue has carpet, Dance floors are an ideal way to create a dancing area leaving the carpet intact. We cover all areas In the Midlands, Staffordshire, Worcestershire. We at ‘Wedding DJ Birmingham’ are now pleased to offer a Black and White Dance Floor, This brings style and elegance to any event including Wedding, Birthdays and proms etc. 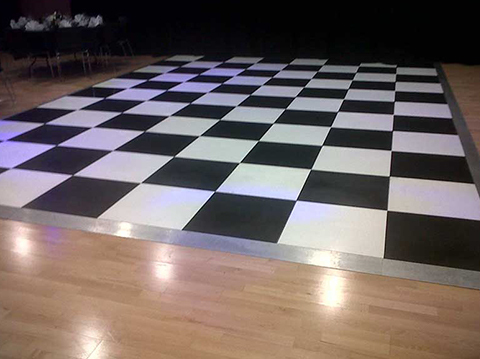 Our black and white dance floors are solid with a beautiful shiny finish and are kept in perfect condition. 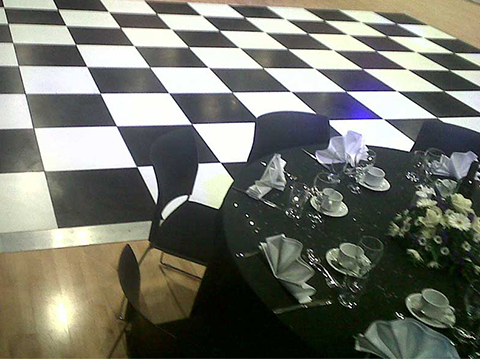 Our black and white dance floors come in sections of 2ft by 2ft (600mmx600mm)and come with aluminium sloping edging, which is perfect for easy access for guest entering and leaving the dance floor. 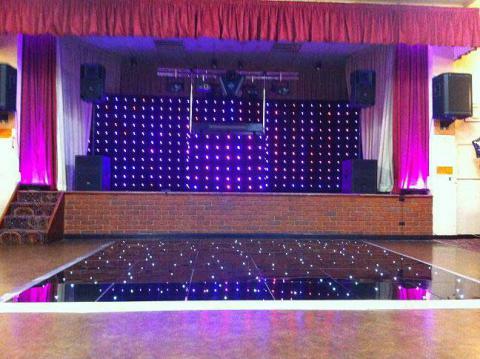 As with all our Dance Floors, they are ideal for barns and hotels. As we can also provide other services like Mobile Discos, uplighters, balloons, LED Curtains, chair covers etc, we can normally provide all of this in 1 visit, Also you are dealing with one company instead of three or four separate companies which overall should work out cheaper and less hassle. These are truly amazing and can give the wow factor to any party. There are many bright LED lights which can be controlled by a controller. The Starlit Dance Floor as also ideal for catwalks, fashion shows or walkways for an awards night, as they are designed to be laid both square or rectangular in shape. As a rough guide, We allow around 30% of your guests will be dancing at any one time. Or if you tell us about the venue, we may know it and we can tell you roughly what space is available. Below is a table to work out roughly what size dance floor you require, the following sizes are our most common but we can provide other sizes to suit yourselves and the venue.